Visiting the “Calaveras” master, Omar Reyes Vique, in Berlin. There’s a cactus on the windowsill, Mesoamerican masks hanging on the walls, and, of course, the room is full of skulls. But don’t be alarmed: We’re not in a haunted house, but in Marcelo Omar Reyes Vique’s apartment in Berlin, where he’s going to tell us about the Mexican traditions surrounding the “Día de Muertos,” known to most of us as the Day of the Dead. The fact that Omar makes Mexican sugar skulls isn’t so much a decision but a necessity, as he hadn't seen them anywhere else in Berlin. Mexican sugar skulls are an integral part of Mexican culture, and Omar tells us that “Skulls play a large role in Mexican folklore, so it’s not strange to see them everywhere." A particularly special part of this tradition is the “Día de Muertos” which is celebrated each year on November 1st and 2nd. The celebration has its roots in the pre-Hispanic era, but Catholic elements have also developed over the years. 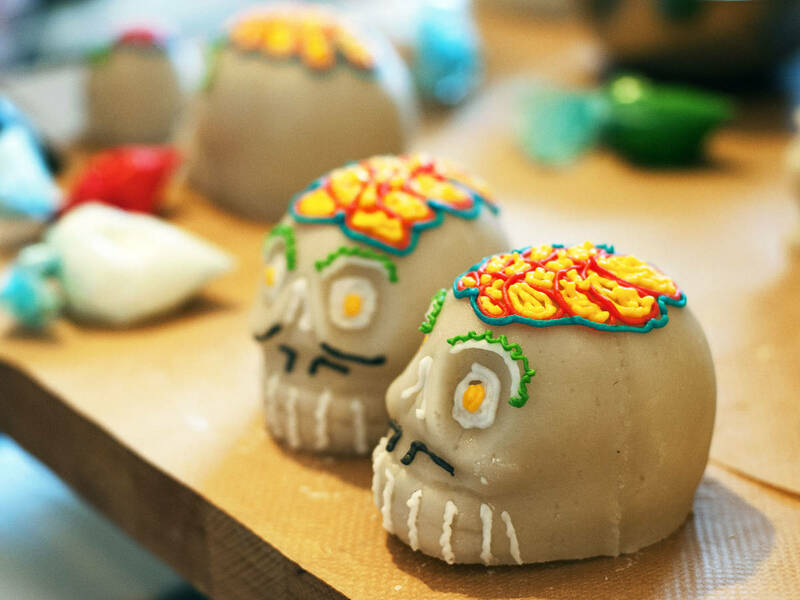 When we visited, Omar showed us the process behind making sugar skulls, and kindly explained every step to us in detail. When preparing to make the sugar skulls, the clay molds must first be plunged into cold water before filling them with hot sugar syrup. When it comes into contact with the cooled mold, the sugar forms a crust and solidifies. The sugar must be completely cool before being removed from the molds, so as not to damage or knock the skulls out of shape. After their removal, they are then ready to be decorated with extravagant, elaborate, and colorful designs and displayed on altars and shelves throughout Mexican households and restaurants. In Mexico, skulls are a symbol of remembering the dead. In order to celebrate “Día de Muertos,” an altar is erected in the family home of the deceased person, which is then decorated with candles, incense, and flowers. Additionally, families add items that were liked by the individual during their lifetime, oftentimes including their favorite foods, some tequila, and of course, the vibrant “Calaveras” (sugar skulls). If your curiosity is peaked, we could recommend booking a flight to Guadalajara straight away. But if you don’t have time for a trip, why not tide yourself over with our recipe for Mexican Mole Chicken? Its traditional Mexican flavors will bring you one step closer to the “Día de Muertos” festivities. Omar, born and raised in Mexico, has been living in Germany for 12 years and you can find his food stall at the Castle Pub in Berlin, where he sells his Mexican food three Saturdays a month. His newest sugar skull creations can be found on his website, at Cuervo La Calavera.